American statesman, was born in Charleston, South Carolina, on the 24th of February 1724, of Huguenot ancestry. When sixteen he became a clerk in a counting-house in London, and later engaged in commercial pursuits with great success at Charleston until 1771, when he retired from active business. He spent the next three years travelling in Europe and superintending the education of his sons in England. 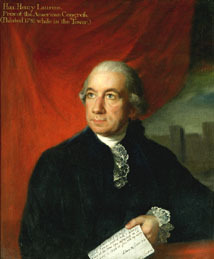 In spite of his strong attachment to England, and although he had defended the Stamp Act, in 1774, in the hope of averting war, he united with thirty-seven other Americans in a petition to parliament against the passing of the Boston Port Bill. Becoming convinced that a peaceful settlement was impracticable, he returned to Charleston at the close of 1774, and there allied himself with the conservative element of the Whig party. He was soon made president of the South Carolina council of safety, and in 1776 vice-president of the state; in the same year he was sent as a delegate from South Carolina to the general Continental Congress at Philadelphia, of which body he was president from November 1777 until December 1778. In August 1780 he started on a mission to negotiate on behalf of Congress a loan of ten million dollars in Holland; but he was captured on the 3rd of September off the Banks of Newfoundland by the British frigate "Vestal", taken to London and closely imprisoned in the Tower of London. His papers were found to contain a sketch of a treaty between the United States and Holland projected by William Lee, in the service of Congress, and Jan de Neufville, acting on behalf of Mynheer Van Berckel, pensionary of Amsterdam, and this discovery eventually led to war between Great Britain and the United Provinces. During his imprisonment his health became greatly impaired. On the 31st of December 1781 he was released on parole, and he was finally exchanged for Cornwallis. In June 1782 he was appointed one of the American commissioners for negotiating peace with Great Britain, but he did not reach Paris until the 28th of November 1782, only two days before the preliminaries of peace were signed by himself, John Adams, Benjamin Franklin and John Jay. On the day of signing, however, he procured the insertion of a clause prohibiting the British from "carrying away any negroes or other property of American inhabitants"; and this subsequently led to considerable friction between the British and American governments. On account of failing health he did not remain for the signing of the definitive treaty, but returned to Charleston, where he died on the 8th of December 1792.